The Family History Writing Challenge takes place in February, and for the 6th year in a row I participated again. Basically you commit to writing about your family every day for 28 days. I had to miss 4 days as I was up in Iowa creating new family stories, so I will continue on past today with those posts. This year I wrote about the Kubler family. If you are interested in what the challenge is all about, you can find my posts here. 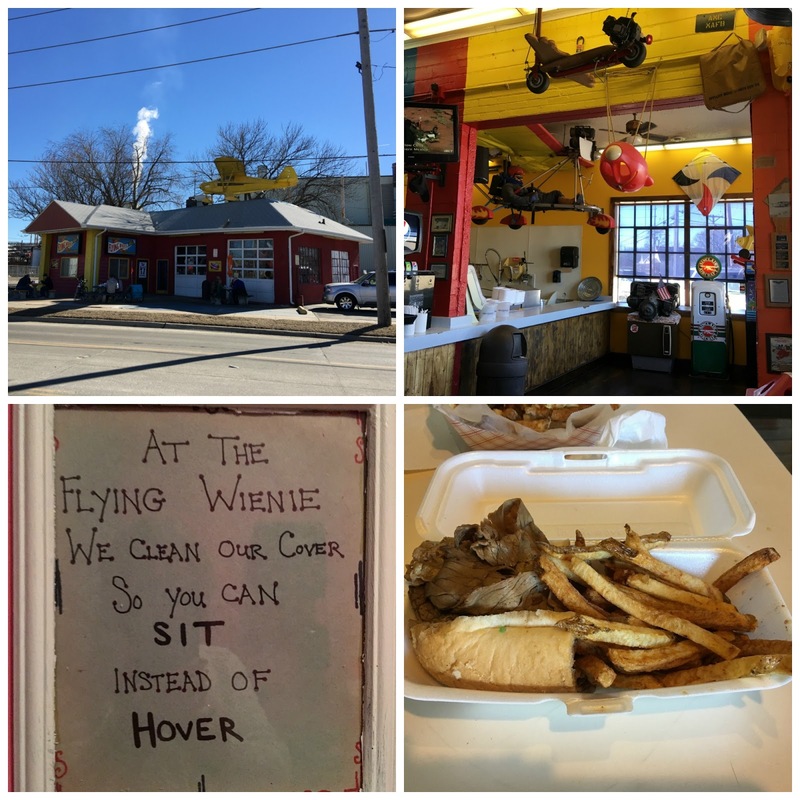 Before we left for Iowa, I was looking for a couple of fun places to stop on the way up to my in-law's house. Because Kirby always made this trip with us, it has been helpful to break out of our old routine and go places we could never go when he came along with us. I came across a website called Roadside America. What a fun site! You enter the state you will be traveling through, and it gives you a listing of all the oddities in that state. You can look at the attractions located in an alphabetical listing of town names, or you can review the attractions pinned on a map so you can see which ones are on the route you will be driving. That is how we came to stop at the Swedish Heritage Museum located in Swedesburg, Iowa. 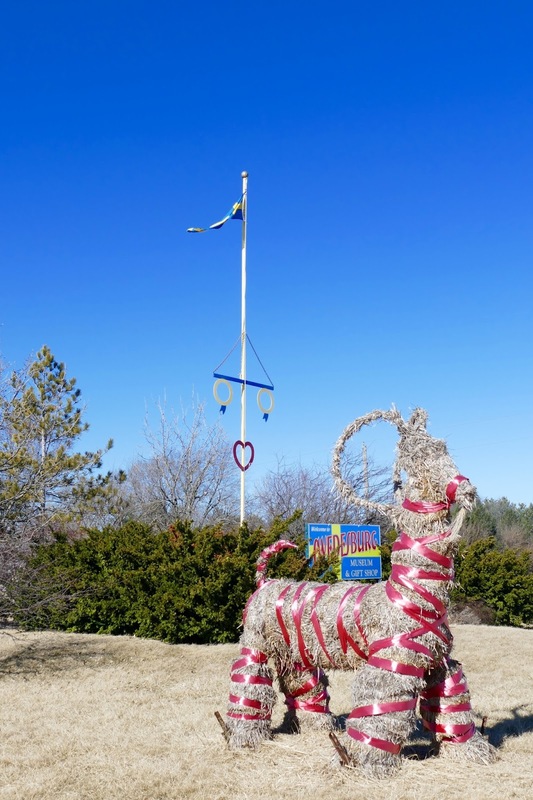 You can see the Julbock (straw goat) and sign from Highway 218, so we have driven past this over 100 times in the years we have lived in St. Louis. But we never took the time to stop. Originally my thought was to just grab a quick picture, but we ended up going into the museum as well. Am I ever glad we did! The docent was incredibly knowledgeable and friendly, and we enjoyed getting to know the origins of the town and the Swedish people who settled in the area. The antiquities included in the museum are amazing. There were no photos allowed inside, but I was amazed at the quality and quantity of items that have been donated by local family members. The general store and tinsmith shop certainly take you back in time. Roadside America also led us to a new place for lunch - The Flying Wienie in Cedar Rapids. 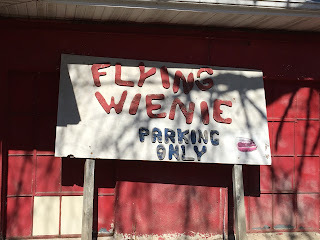 You can't make this stuff up...After photographing the exterior, we went inside to presumably order a wienie. We were not expecting the variety of options on the menu. In the end, my husband could not turn down an Iowa pork tenderloin sandwich, and I was lured by the smell of the Italian beef sandwich. The choices we made were good, but not great, so if we ever stop again we'll go for the hotdogs. If you ever decide to visit Cedar Rapids, I am including a little tip for you below. 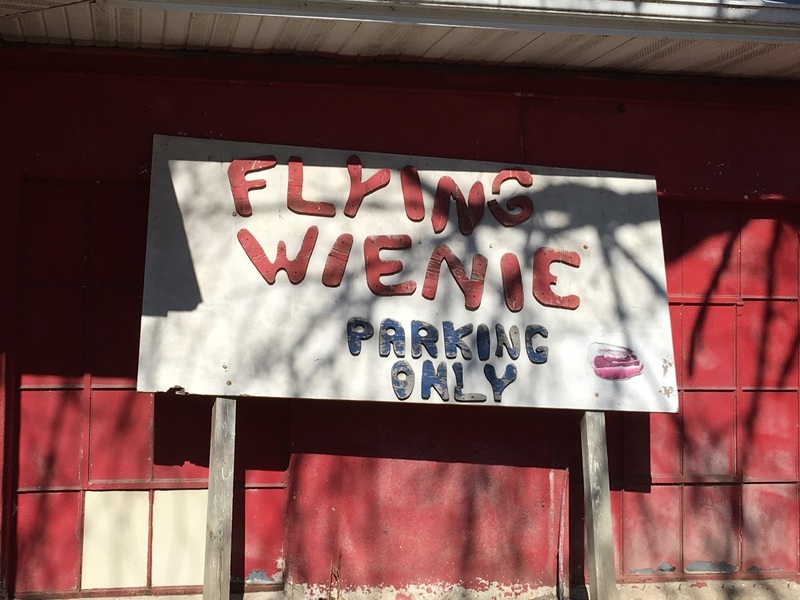 Because if you have a flying wienie, it's always good to know where to park it. Jim and I went to Charles City, Iowa for a wedding anniversary over the weekend, but first we attended the latest Women in Focus photography exhibit. Held at Third Degree Glass Factory, the opening coincided with their Third Fridays monthly event. 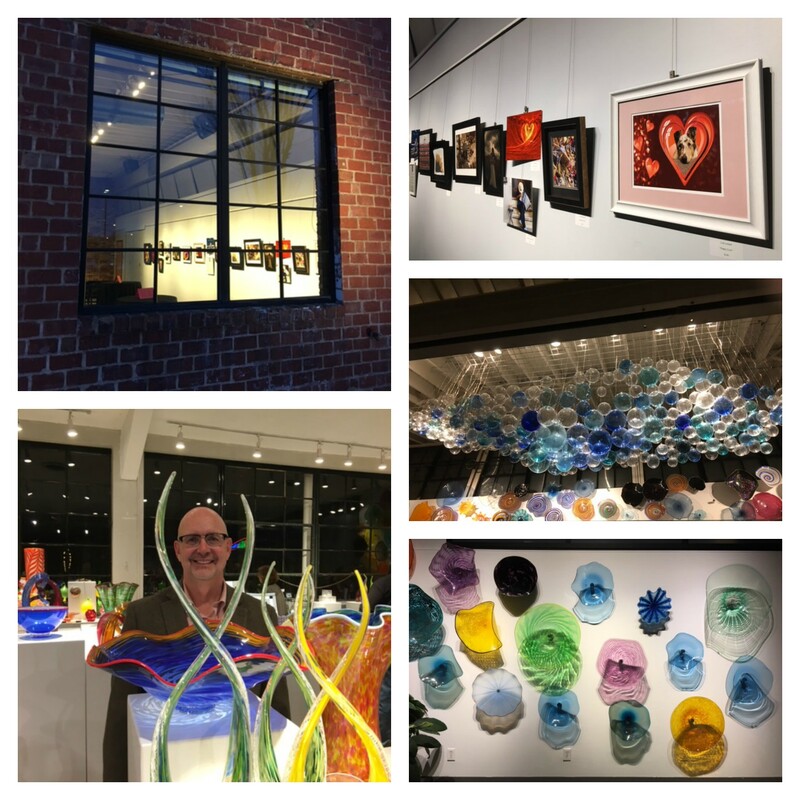 Every third Friday of each month, Third Degree offers glassblowing demonstrations, food from local caterers or food trucks, live music, and a new exhibition in their east gallery. That is where the Women in Focus show entitled "Passion" is being displayed for a month. The event opens at 6:00, and Jim and I arrived a little before that to find the parking lot already full and about 30 people waiting in line to get in. We were amazed! Having never attended Third Fridays before, we had no idea what to expect. The evening was quite fun, and the photos on display by our group are excellent and thought-provoking, as always. Saturday morning we got up early to head up to Charles City where we had a big surprise in store for my husband's parents. 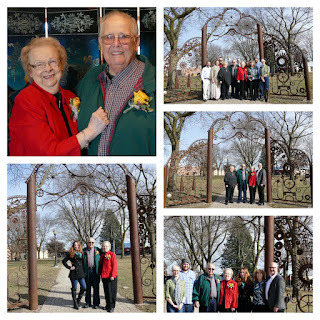 They knew that the two of us were coming up to help them celebrate their 65th wedding anniversary, which happened to be February 18th. But they had no idea that our son and daughter-in-law were flying in from Washington, DC., or that our daughter would also be flying in from Los Angeles. These plans had been in the works since Thanksgiving, when the kids were able to arrange their flights into Minneapolis on the 18th arriving pretty close to the same time. They wanted to be able to rent one car and drive to Charles City together. With the flights settled, we only had to worry about the weather. When my in-laws were married, a snow storm kept some guests from being able to attend the wedding and reception. 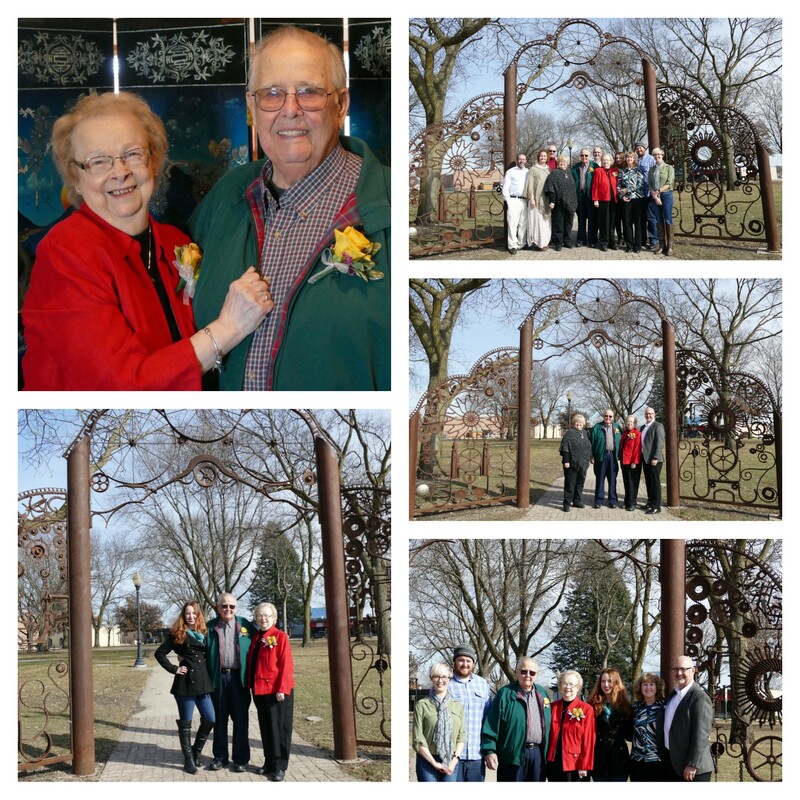 When the time came to plan their 50th anniversary party, they decided to have the celebration in April to avoid the possibility of snow. But guess what? It snowed that weekend in April. You just can't fool mother nature! The weather gods were kind this time, and we had unseasonably warm weather. It was sunny and warm (for northern Iowa) on both Saturday and Sunday. We were even able to take some photos outdoors in the park on Sunday afternoon following Mass and a small dinner party at the local Chinese restaurant. Thank goodness for tripods and the timer on my camera. All of us were able to stay in town until a little after noon on Tuesday, so there was plenty of time to catch up, play cards, puzzles and other games, and of course eat some amazing food. Our children rarely get the opportunity to see their grandparents as everyone lives so far away, so I am beyond grateful that things worked out for us to share this time together. 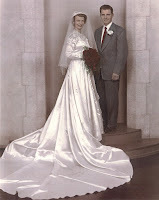 I have been fortunate to have Jerry and Lorraine Wolterman in my life for over 40 years. They are a constant source of inspiration to me, and have set a loving example of what marriage should look like to all who know them. There is no "in-law" after father and mother in either my mind or my heart with them. They raised Jim to be the man that I fell in love with, and I know that our own marriage is stronger for the example that they have set for both of us. Jim took his annual trip to Chicago this weekend with a riding friend to go the the motorcycle show, so I had the house to myself. I don't particularly love that since my little house buddy is no longer here to keep me company. But I am adjusting. Friday night I took a gal pal with me to see "Something Rotten!" at the Fox. I knew nothing about the play other than some vague reference to Shakespeare and the fact that it had been nominated for 10 Tony Awards. Since I am not a huge Shakespeare fan, I chose not to read anything more about the show as I didn't want to have the wrong attitude going into the performance. This show has you laughing from the very beginning. It is fabulous - maybe the best play I have ever seen, and that is saying a lot. I highly recommend it! Saturday my niece came over to borrow one of my cameras. She is photographing the rehearsal dinner of her co-worker's stepson. I am a little anxious for her as shooting indoors is always tricky. I try to avoid it myself, and usually resort to using my iPhone because it seems to do better in low light. Without bringing in auxiliary lighting, which I don't own, it is hard to take flattering pictures. The built-in flash on the camera always seems to be too hot, washing the people out. I am not available that night, or I would go with her and take a second camera so she would have more pictures to choose from. Oh well...Coincidentally, the dinner is at 3rd Degree Glass. My Women in Focus group has a show opening there on Friday night, so at least I'll be able to scope the area out for her and see what the lighting is like. At any rate, it was great to see my niece as we never seem to be able to get together, especially one on one. Sunday I went to the Cathedral Basilica as my photographer friend wanted to retake the photo she is planning on using in our show. 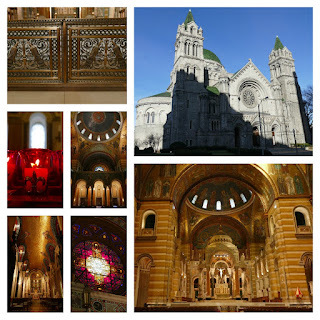 The cathedral was completed in 1914, and designated a basilica by Pope John Paul II in 1997. Installation of the mosaics inside began in 1912, and the last of the 41.5 million tiles was laid in 1988! Covering 83,000 square feet, it is the largest mosaic collection in the world. What an amazing building! No matter how many times I go inside, it just strikes me dumb. 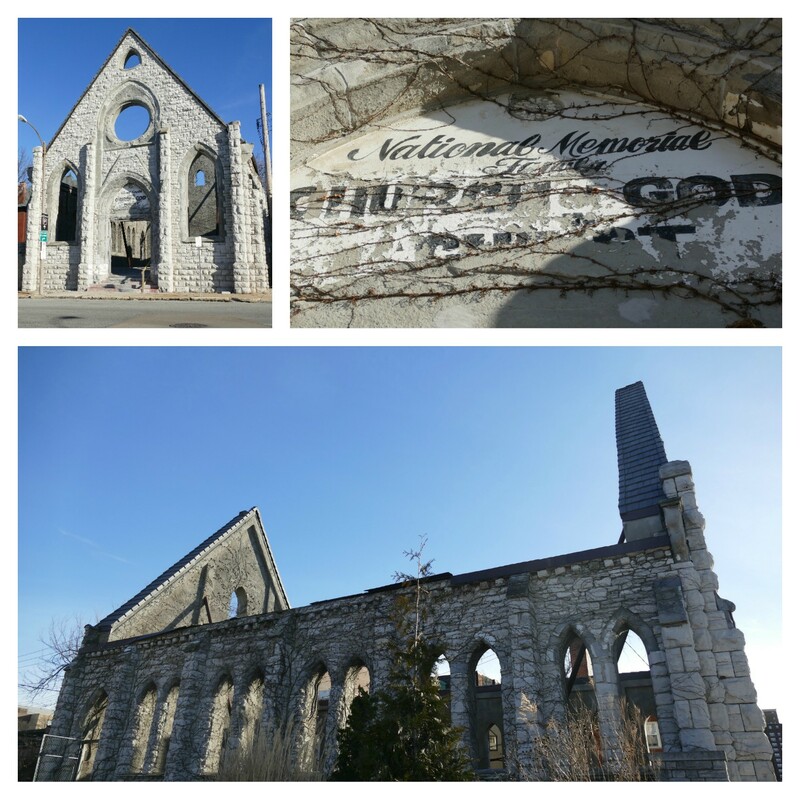 From there we went to Grand Center, where the skeletal remains of a burnt out church stand. 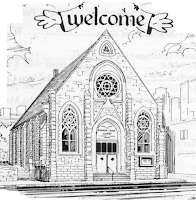 Located at 460 N. Spring Street, the church was built in 1884 for a Baptist congregation. 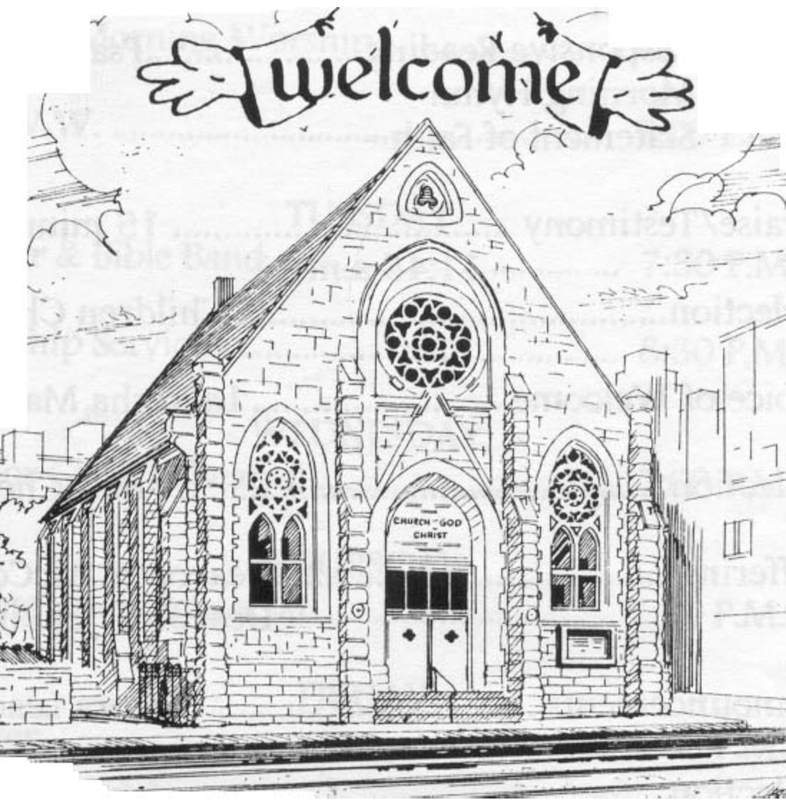 A fire in 2001 destroyed the church. Some reports say that lightning struck the building; others insist an electrical fire was the culprit. I have looked at many photos of it, but never seen it in person. The lighting with the bright sun wasn't particularly favorable, but at least I know where the church is now so I can go back. We had intended to end our photoshoot at The Grove, but despite the sun and temperature it was chilly out due to the high winds. We decided to tackle that location on a warmer Sunday morning. Each year the Webster Groves-Shrewsbury-Rock Hill Area Chamber of Commerce hosts the Heart of the Community Awards Dinner. This year the event took place on Friday, February 3rd at the Westborough Country Club. The ceremony was particularly exciting as Jim, along with his company SWT Design, was given an award for Outstanding Green Initiative. What was especially rewarding was the fact that two people from two different communities nominated him. Recognizing both the green design that he and his firm have brought to Webster Groves and many other areas as well as the fact that SWT "walks the talk" in the design and renovation of their own corporate campus in Shrewsbury, the award is certainly evidence that what Jim and his company are doing is being noticed in the area. It is so wonderful to live in a community that gets it! It was nice that several of Jim's colleagues were able to join us at the event, and an added bonus that my friend Linda provided the musical entertainment for the night. Sunday was such a gorgeous day that I knew I had to go shoot something. With my camera, that is. I contacted one of my photographer friends, and she readily agreed to accompany me. 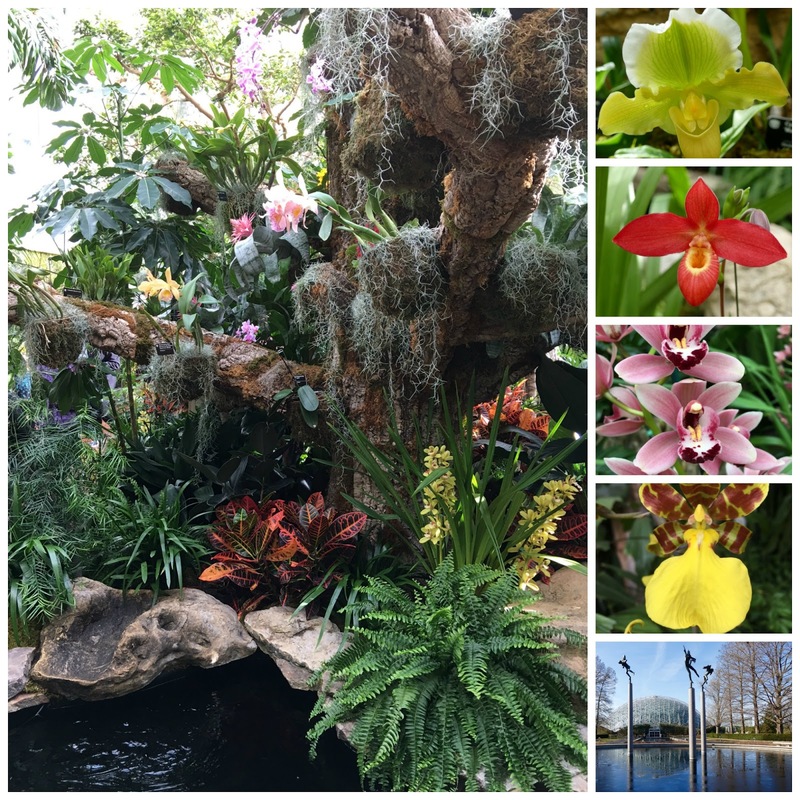 As the morning was still a bit chilly, we first went to the Missouri Botanical Garden for the annual Orchid Show. It is one of my favorite events at the garden. 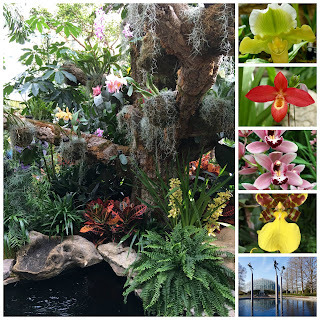 I am always in awe over the stunning array of various orchids that are on display. Surprisingly, especially since the show just opened on Friday, it was not too crowded. Perhaps everyone was at home getting ready for their Superbowl parties. We had lunch at the garden, and took a stroll outside for a bit before heading to our next destination. 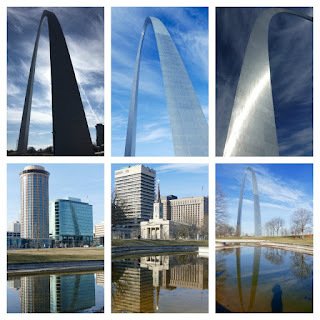 My niece has been posting photos of progress at the St. Louis Arch grounds as she works downtown and often runs on her noon hour. I wanted to check things out for myself, so that was our next photo stop. 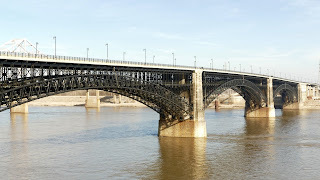 I never tire of taking photos on the riverfront. I absolutely love the workmanship of Eads Bridge. Completed in 1874, it is still in use today for both cars and the Metrolink. It was hoped that the renovations on the arch grounds were going to be completed by the time the arch turned 50 years old, October 28, 2015. (As an aside, the arch and I share a birthday, albeit 10 years apart.) Obviously, that deadline has come and gone. But I will say that a lot of work has been accomplished since I last visited the landing area this summer. I think it will be very nice when finished, though I have concerns about parking as they tore down the parking structure closest to the arch. While it may be fine for buses to drop off kids on the landing and let them scramble up the dozens of steps leading to the arch, the elderly or infirm will not be able to make that climb. Even the newly installed handicap ramps would be a challenge for some. And we know that tourists in particular like to park close to their destination. I'm thinking they won't pay the $25 being asked to park on the levy. Suppose they build it and nobody comes? We found a nearby lot charging $5 to park, but it was a quiet Sunday with no baseball season yet in play. I'm not sure what their rate will be during the busy season. Regardless, we had a fairly short walk to the arch. The weather was perfect, the sky was amazing, and I got my 10,000 steps in. Now THAT's a winner!